Technology has changed so rapidly over the past several decades that it's difficult to keep track, much less up to date with, all of the advancements those changes present. And there are few career fields where technology offers as many opportunities and pitfalls as policing, which is why many agencies now offer law enforcement technology officer jobs to keep up with the ever-changing technological world. The entire historical timeline of criminal justice and criminology is full of technological and other advancements by an enterprising officer and scientists who found ways to make the job easier, more effective and more efficient. But whereas changes were once gradual and incremental, the so-called technology curve has made tracking and implementing technologies for industries like law enforcement a full-time job. A police technology officer plans, directs and guides technology decisions for her department. She does this by applying her experience and knowledge of law enforcement principles and practices in combination with knowledge of computing and other technologies and overall technological vision. Essentially, a law enforcement technology officer's job is to ensure the department's current technologies continue to work properly while at the same time looking forward to identify technologies on the horizon that can help police officers and agencies carry out their missions. Technology officers oversee the maintenance of current systems and the purchasing of new systems and equipment. They also identify technologies that may affect the law enforcement community in the ever-changing social and technological landscape. In short, the job of the law enforcement technology officer is to prepare police departments for the future, wherever that may lead. Often, the specific requirements for a law enforcement technology officer are loosely defined. The two most important qualifications, though, are a background actually working as sworn police officer and a better-than-average understanding and appreciation for computer systems and technology. 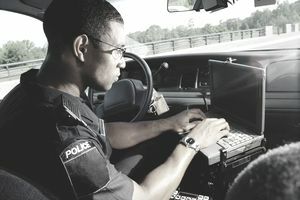 Technology officers often first become police officers and work their way into the potion, either because of a prior personal or professional background in technology. Law enforcement technology officers receive both formal and informal training. They attend seminars and conferences to stay up-to-date on police and other technologies. They can also attend specific computer and information technology-related training programs to improve their skills and working knowledge. Technological systems and infrastructure are critical to any modern police department. Because of this, technology officers need to have the unique know-how to understand what needs to be done and the authority to make it happen. Technology officers often hold high ranks within their departments and enjoy higher salaries, often earning more than $100,000 per year. Police technology sections, while critical, are often small, meaning opportunities are hard to come by. The best way to have a chance at working in police technology is to hone your technological knowledge and skills while continuing to serve your community. Volunteer to assist with major technology implementations within your department, read and stay up to date on police tech, and develop a vision for your agency so that you're ready and able to ace the job interview when a position does come available in your department. Consider Becoming a Law Enforcement Technology Officer? Just as law enforcement isn't a job for just anyone, not everyone has an interest or background in technology. If you're a person with a unique combination of law enforcement experience and technological know-how, though, a job as a police technology officer can be the perfect criminology career for you.